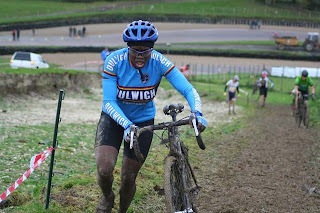 After a 2 week break I was keen to get in my fix of cyclo cross. I wasn't that keen to put in a 90-minute journey down the A2 to get there, all with the prospect of racing in the pouring rain, and muddying up my newly cleaned and serviced knobbly steed. To compound things further I'd had trouble getting out of bed before 10.30am and my head hurt - all due to having been on a bender with Fred last night. Well, after weighing things up I realised that I had no choice but to go - especially as I was going to miss a couple of London League rounds due to upcoming weekend trips away, and I wanted to build on my healthy points tally in the league. So when George pulled up at my house to pick us up we hurriedly scrambled our bits and pieces together and boarded his big van, Doverbound. When we got there, I realised I hadn't factored in just how muddy it was going to be. We'd had rain all day on Saturday, and even as we arrived we had a heavy downpour. 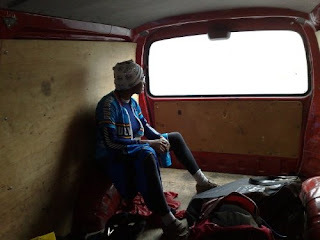 I penned myself into the van, hoping that the rain and wind might subside. Eventually it did, and the sun even made a tentative appearance. Five women signed up, which was a healthy turnout considering the bad weather. At these races I tend to limit the amount of time I spend riding around the course as I prefer to start the race on a mud-free bike. I couldn't avoid this hitch though. I did my recc'ing on the trickiest and muddiest section of the course. Having so much guey stuff to ride through tends to level out the playing field. In fact the five of us were never really that far apart. I was madly chasing down Claire (London Dynamo), while Helen (Crawley Wheelers) and Abi (London Phoenix) were madly chasing me down, followed by Nicola (Kingston Wheelers) who battled to chase down the 3rd and 4th placed women. It was a very unpredicatable race, with all of us falling at some point or other. One of the climbs quickly became unrideable as the mud on the slope was so churned up. For a few people, myself included, it even became unwalkable. Many of us slid around on all fours struggling to keep hold of their bikes and get some upward motion. We might as well have ridden up a custard covered slope - at least it would've tasted nicer ! In my mad attempt to chase Claire down I made a few bold moves on the obstacles. On one short steep mound I approached it at full throttle hoping the momentum would carry me up and over it. In fact I went so hard at it that me and the bike got airbourne and I landed with a splat in the mud. At least I managed to provide some entertainment for Helen, behind me as she couldn't help but giggle ! 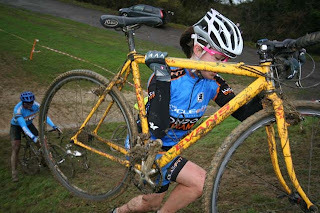 Sadly, Helen soon stopped giggling when her rear mech snapped and it was game over for her. I continued on my soggy way, wriggling through the mud and skidding around on a few of the gravelling turns. As the race wore on, I fell more and more frequently as I was getting too tired to wrestle with my bike which at times had a mind of its own! Then, just when I was calculating my final moves on how I should catch Claire, I heard "snap" as my pedalling motion was abruptly stopped. I looked down, and there was my rear mech in the spokes - bugger !! So with a sorry heart, my race ended. I almost came second, but now I was nowhere. Although there'd been a good vibe at the race and overall it had been fun, you always get a real feeling of futility. All that travel and effort for nothing. True, the muddy stuff adds to the fun of cyclo cross but sometimes that fun goes a little too far and things just get a bit frustrating. So in the end, Claire won, Abi was second, and Nicola finished third. Well, I've got another break as we're off to the (cyclo cross free) Emerald Isle. 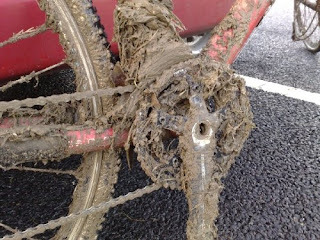 Hopefully, my knobbly steed will show me that it can get the better of the mud in a couple of weeks time at Penshurst. I give you Thanks !